When people think about the homeless crisis, they often picture all the struggles homeless people have getting a job, staying safe, fighting a drug addiction, and finding food. However, an often overlooked challenge of being homeless is what happens when a person needs to heal. This issue is apparent in California, an area that tends to have a lot of homeless people due to its astronomical rent rates and warm weather. Between 2015 and 2017 alone, there has been an increase of 28 percent in homeless patient discharges from California hospitals. This soaring number of patients is due to a combination of shifting laws and real estate trends. Part of the increase is just because the number of homeless people is rising. California has a very high cost of living, with even the smallest apartments costing thousands of dollars each month. Another reason that there are more homeless patients in hospital is that new state laws have started requiring hospitals to provide clothes and meals for homeless patients as they are discharged. Legally, hospitals are required to try to find the patient a safe place to heal in. For many patients, this can involve some sort of voucher that lets them stay at a nearby nursing home, hotel, or shelter participating in a homeless healing program. However, the high rates of homeless patients mean that they cannot find space for everyone. Hospitals are doing their best, but they are simply overwhelmed and stretched to capacity. Sadly, if a hospital cannot find a place for the patient to stay, they are often left to their own devices. 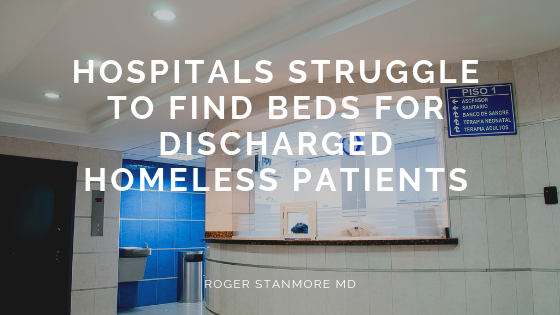 Without access to a safe place to sleep, clean water, or nutritious food, it can be almost impossible for a homeless patient to recover from time spent in a hospital. Many patients still need intense follow-up care or assistance after they leave the hospital, and shelters are not equipped to meet these needs. Some cities are making moves to address this issue, such as the 62 bed homeless healing facility recently opened in Los Angeles. Unfortunately, demand still outpaces supply, meaning that many suffer to heal after they leave the hospital. Without the ability to recover properly from surgery, procedures, or illnesses, many people end up with infections or other post-hospital complications that further damage their health.